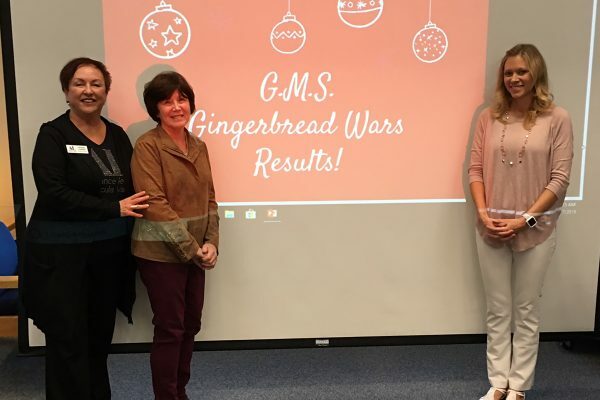 Assistance League Sites > Assistance League - Temecula Valley > Uncategorized > 20 Murrieta district teachers are awarded more than $8,000 in grants for class projects. Twenty Murrieta Valley Unified School District teachers applied for Assistance League of Temecula Valley’s teacher grants for enrichment programs for their classrooms that could not be funded by the school district. A total of $8,405 grants were awarded. Teachers received their grant money in the fall and have started implementing their proposals. 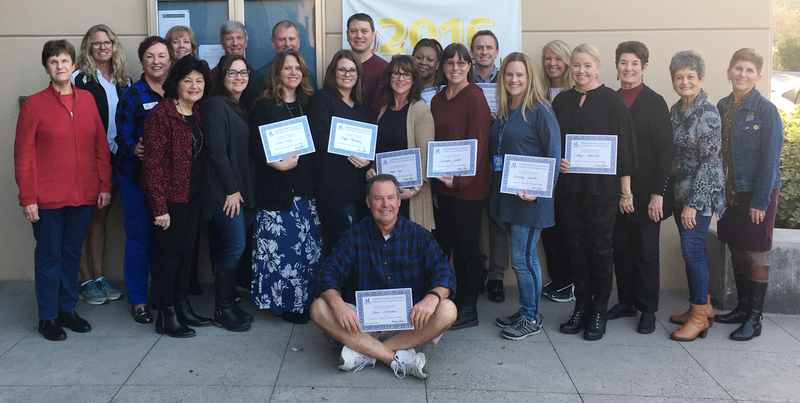 At an awards reception on Wednesday, January 30, at the MVUSD district office, hosted by Mary Walters, Assistant Superintendent of Educational Services, Connie Harris, Assistance League Scholarship/Grant Chairman, handed out Certificates of Appreciation to the teachers. Chapter President Denise Lanier, Grant Committee members Dorcas Shaktman, Joleen Buxbaum, Joan Price and Electra Demos also attended. Shaktman gave background information about Assistant League’s scholarship and teacher grant programs. She explained the grant selection process and told the teachers how impressed she ad the committee were with their proposals. Teachers had the opportunity to describe their particular enrichment plan. Individual grants ranged from $120 to $500. Winning proposals included purchasing materials for a sensory center to increase learning for Special Education preschoolers, materials to increase social/emotional learning in middle school and materials for a new journalism class which publishes a student run newspaper. 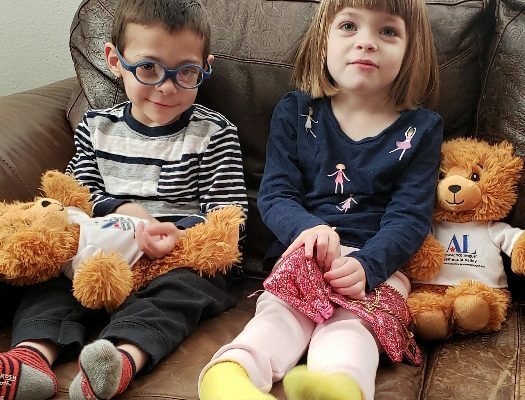 Purchase materials for a Sensory Center within the classroom to increase learning for Special Education preschoolers who require sensory breaks throughout the day in order to assist them with learning. BackJack chairs to increase kinesthetic learning in an in-depth way by providing comfortable seating. LEGO brick software materials and projects for Science using hands on materials. 25 books by Julia Cook that address social skills that the students are learning. Pipe and drape room divider to increase space and numbers of students who can participate in Dance PE. Board games for the classroom to increase social, learning , listening, and attention skills. Supplies, including journals, markers, pens, crayons, social/emotional books, and guidance. Purchase a monthly subscription to study.com to provide supplemental videos and curriculum, to increase language skills. Purchase for the SDC Class “The Learning Carpet” for use as Multi-modal approach for learning. Provide one “calm down” kit for every classroom in the school to create a place where students can use various sensory materials when they are under stress and experience anxiety. Office supplies which parents cannot provide, including binders, notepaper, and sheet protectors to help students with organizational skills, a main goal of AVID. Indoor Basketball Hoop Shooting Arcade Style Game (accessible to students in wheel chairs), to be used as sensory breaks for special needs, autistic, and other students who have special equipment or need a break. This Game addresses PE standards for gross motor skills, strength, etc., and addresses IEP Goals. “Flocabulary” Songs and weekly videos subscription – which mixes music and math, increases vocabulary, and helps students master content. A class set of 9 diverse novels that will be chosen with student input and used in small groups to read, enjoy, study, and analyze. “Literacy in Action, Social Equity Unit” to build in-depth analysis of texts with in class reading, Book Talks, and Book Clubs. These activities will increase student reading, writing, listening and speaking skills. Purchase start up materials for new computer class, “Exploring Computer Science” which teaches creative, collaborative, and problem-solving skills that involve kinesthetic learning prior to the use of a computer. Purchase books for US History Class that appeal to middle school students. Small group instruction and taking Cornell Notes will help students learn about history in an interesting, exciting way. Purchase materials to increase Math and Science Learning, such as measuring tools, meters, etc. The goal is to offer students varied measuring tools to complete multi-step, hands-on real-world measuring tasks. Materials for new Journalism class that publishes a student run newspaper, The Phoenix Press. Materials purchased include a newspaper format template service, printing of the newspaper, and purchase of a scanner (to scan photos, student art, etc.). Photo Caption: Grant recipients, district administrators and Assistance League representatives gather for a group photo after the presentations.